The Vikings war of clans guide will show you in what you must set to become the Jarl of the Vikings. Maybe it’s the fastest way to level up and start achieving everything. Unless you are a veteran and know what you are doing, I recommend you to read this Vikings war of clans guide. When you start a new game, you should always focus on collecting all the possible resources and being able to amass a good amount. The game has a way to accelerate the speed at which you can skip the wait of time and get the resources of one. If you do not meet the requirements to build something, you can always click on the “Go to” button to go to the building that you have to improve and update before being able to take care of the rest. Continue in this way until you have all the resources and everything will be fine. Virtually nothing else start asking us the farm to supply supplies, needed to increase the population and military units. We have other resource buildings that should not wait long to be built, such as the sawmill, the pit, and the mine. As in the popular Clash of Clans game, you can have a really good time collecting, attacking and plundering resources and sources of wealth from other realms of players who are no longer active. These are usually kingdoms with some interesting resources but no troops, and you should, by all means, attack them and keep those materials that are sorely needed by you: wood, stone, iron, silver, and food. You will need many many troops in this game, and make sure they are always updated and improved. Keep in mind that the more troops you have, the more food they will consume. This means that you have to make sure that they have enough food by building and continuously improving the farms. A good way to improve food reserves is to send your troops on extended missions so they do not have to eat from home for a while. And this is the best hint in Vikings war of clans guide. 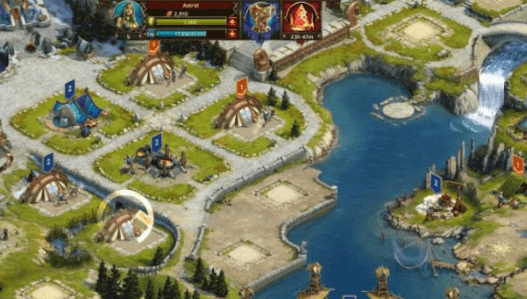 There are a lot of missions in Vikings: War of Clans and it is a good idea to complete as many as possible to score more gold, recourses and experience. But you do not have to Jaguar the resource reward missions until you really need those resources. Nobody is going to be able to steal your rewards if you leave those reserved quests in your folder, but if you claim the rewards too soon then you will be more powerful enemies with a desire to attack you. We cannot insist more on this point but it is very important that you join a clan as soon as possible, especially if it is a clan with many active players. This will give you enormous rewards and advantages in front of your enemies, especially if you count on your side with trusted players. 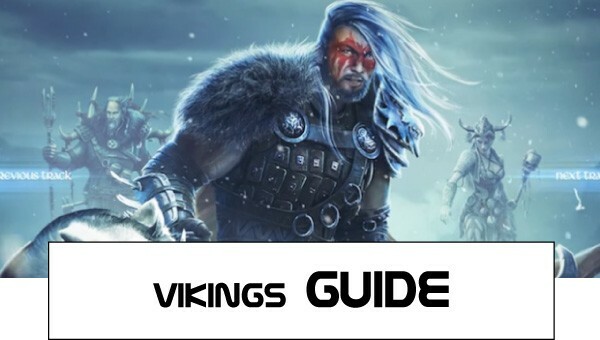 Get Vikings war guide and tips for earning, initial development and civil strife. Each player, whose palace has not yet reached the sixth level, is available “Moving Rookie“. This feature allows you to change the kingdom (ie, server) in which your city is located, to a more preferred one. For example, in order to be closer to friends or players of a level similar to you. By clicking on the “Power” icon at the top of the screen, you can change the name of the city or the name of the hero. For the first time, this procedure will not cost a penny, but for the subsequent ones, you will have to pay. 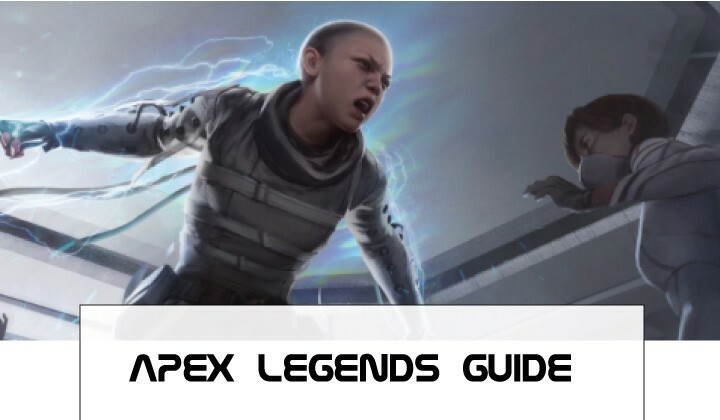 This will help to distinguish the very “green” newcomers from experienced players and better navigate the ranks of the clan. Link your account with your Facebook account – this will give you a whole thousand gold coins. If you do not want to use a real profile, you can always create a dummy. In order to be able to play Vikings on multiple devices, communication with Facebook is required. Once in the city, first of all, build several pieces of all types of resource-producing buildings: farms (food), sawmills (wood), quarries (stones), mines (iron) and estates (silver). Farms are the most important because they provide food for your soldiers. Move city to another kingdom? The level of the palace reflects the overall level of your city on the global map and determines the extent to which other buildings in the capital can be developed. As mentioned earlier, when the palace reaches the sixth level, you will lose the opportunity to transfer your city to another kingdom, but you will receive an item to move to any other point on the global map (within the kingdom). Do not neglect the Oracle (a large purple building next to the palace) – it gives you access to several types of Knowledge: economic, military, espionage, training, and invaders. To accelerate the growth of your state, it is worth starting with the first two. Constantly keep something in production: it is impossible to start the improvement and construction of buildings at the same time, but at the same time nobody will forbid you to train soldiers, study Knowledge and build another farm. The longest waiting periods are best left at a time until you are in the game. Check Loki’s Chest as often as possible – it can contain both simple resources and gold with materials for creating objects. For completing assignments, building/improving buildings, and the like, your Hero gains experience points. Upon reaching each level, they can be spent on the skills of two branches: main and aggressive. First of all, we advise you to study the skills of “ Construction ” I and II, as well as “ The speed of learning Knowledge ” I and II – they will help significantly reduce the time for appropriate actions. Join the clan (the “Clan” tab at the bottom of the screen) – do it better as soon as possible, because completing the clan tasks that you receive upon joining will provide your hero with additional experience and resources. In addition, clan members can accelerate the construction/improvement of buildings and the study of new knowledge in your city. when you first enter the game you will automatically receive VIP status for the whole day. It offers a number of advantages, the benefits of which increase with each new level of this status. To pump your VIP-status, you will need a certain number of VIP-points (with each level it will grow). You can get them in several ways: buy for gold in the Bank or for Loyalty points in the clan shop and enter the game every day. As long as the Armistice shield protects your city (this will last for the first few days since the account was created), no other player can plunder it. During this time, try to improve as much as possible the elements of your possessions and get an army. As the initial targets for the robbery, choose cities whose owners have not visited Vikings for a long time (you can check this with the help of spies). If the enemy possessions have no or practically no protection, but resources are in abundance – feel free to send your detachment there. Food, wood, stone, iron, silver. Necessary for the arrangement of your city (construction and improvement of buildings, training of troops, the study of knowledge, etc. ), equipment of the Hero and the maintenance of the army. These resources can be obtained using special buildings (farms, sawmills, quarries, mines, and manors, respectively), robbing resource locations and cities of other players on the global map, completing quests, and Loki’s Chest. In addition, help with minerals, you can ask and clan members. To move up the career ladder or the arrangement of the city is not required, but significantly simplifies and speeds up the process. The main, but not the only way to get gold in the “Vikings” – for real money through the in-game Bank. The remaining options for earning require much more patience and patience: robbing gold mines and the invaders’ lair on the global map, the reward for loyalty (you need to enter the game every day), opening Loki’s Chest and getting a new level by the Hero. To facilitate the extraction of minerals in gold mines, we advise you to move your city (this can be done upon reaching the sixth level) as close as possible to the deposit. To obtain at least one unit of gold from this resource location, you will need a whole thousand soldiers, so prepare for such campaigns in detail. Required for trading in the store of your clan. For Valor points, the elders and the leader of the clan acquire items that will be available for Loyalty Points for the rest of the clan members in the appropriate store. Both types of intraclan currency are mined in the same way – helping other clan members accelerate the construction/improvement of buildings and complete clan tasks. Be careful: for helping other clan members a day, you can earn only a thousand loyalty points and valor. After that, you will have to wait until the timer calculated for several hours. Power is a universal indicator of the progress and power of players, which is used to conditionally divide them into leagues: Recruits, Recruits, Warriors, Generals, Magisters, Odin. The higher the league level, the greater the reward. In addition, a certain amount of Power points is required for entry into some clans. The game itself “gives you” them: to build or upgrade a specific building, to study this or that Knowledge, to train a certain number of soldiers, and so on. As the city develops, you somehow have to complete these quests, so you don’t need to pay special attention to them. for completing quests and tasks you get experience points. They, in turn, lead to an increase in the level of the Hero, for each of which you are awarded several points of Power. Refrain from surrendering missions already completed until you properly upgrade the Warrior’s Hall. With each improvement of this building, the bonus to the experience gained by the Hero increases by 5%, which will help to quickly accumulate the necessary amount of experience for the new level of the Hero and, accordingly, the next portion of Power-points. improve the building of the Oracle and the corresponding skills of the Hero, as well as create in the Forge elements of equipment (with the necessary bonuses) of your character to reduce the time needed to learn Knowledge. In order to maximize the obtaining of Power in this way, do not let the Oracle rest and constantly study something new. as in the case of Knowledge, buildings need to be built or improved constantly. Try to keep especially long processes for those periods when you are not online, and use available accelerators during a game session (for example, you can buy them in an inter-clan shop). To reduce the time of production and improvement of buildings, improve the corresponding skills of the Hero and Knowledge in the Oracle building, and also create equipment items in Kuzna with the necessary bonuses. Training troops:- to protect yourself from losing Power-points as a result of the destruction of the next detachment of your fighters, acquire at least several sickbays. Fallen warriors must be resurrected (this is done exclusively with the help of gold ) within a week from the moment of death, otherwise they, like the associated points of Power, will be lost forever. The first three ways guarantee you a permanent influx of Power, while the safety of Power Points given by soldiers and buildings will depend on the safety of soldiers and buildings themselves. In other words, if you demolished some building or allowed to die (that is, did not resurrect them in the hospital) to your fighters, then the points of Power brought by them will also disappear. In this regard, try to focus your attention on stable sources of Power. There are two types of clans: open and closed. You can enter into open ones without any restrictions (except for the number of participants), and get into closed ones, you will have to first agree with your superiors – send an application and wait for approval (or refusal). Try to join an active and powerful enough clan to get the maximum benefit from participating in it. A good indicator of the success of the clan is the ratio of the number of participants and points of Power. The higher the second value and the lower the first, the more powerful the clan in question. Each clan has a strict hierarchy: leader, elders, generals, warriors, and privates. The first two ranks can purchase (with the help of Valor points) items in a special catalog for the clan’s shop, where other participants are free to buy these items for personal use for Loyalty points. The main goal of each clan is to capture and hold the so-called Place of Power. This is a special location in the center of each kingdom, the possession of which gives the clan a number of significant advantages such as additional silver, gold, titles (they suggest all sorts of bonuses), reducing construction time, studying Knowledge and training soldiers. Disposes of all this prey leader captured the seat of the Force clan. As a member of the clan, double check, before attacking anyone, whether he is a member of one of the friendly alliances with your clan. Otherwise, you can inadvertently violate the nonaggression pact or any other alliance, which will adversely affect your position in the clan. If you have already been the victim of an attack from the party, seemingly not aggressive towards your clan allies, do not rush to strike back. In order to avoid internecine wars, complain about the attacker on the wall of his clan – the leadership of the community will be able to solve this situation without your participation.